Yesterday, I walked into my home, and to my surprise, my friends were there! Lemme back up for a second. I went to my friend's house and we made some brownies, had a tether ball tournament, and laid on the trampoline until I had to go to a trumpet girl party at 7:45. My friends walked me home, and we got to my driveway. I was about to say bye, but she said, "I have to pee really bad... Can I use your bathroom?" And I said she could. And I walked in and everyone shouted "Surprise!" 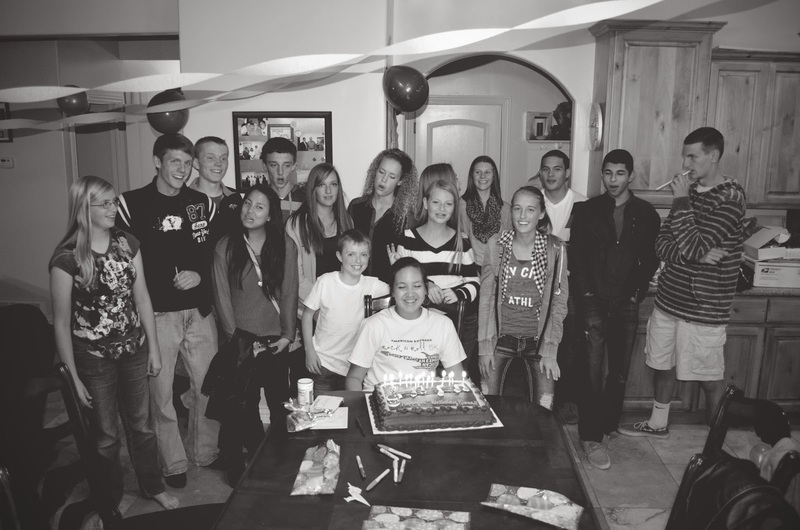 I always dreamed of having a surprise sweet 16 birthday party, and I got it! I had lots of my friends there, both from the ward and from band. We played lots of silly games; ones where we had to sit on balloons and make them pop, string penne pasta through spaghetti with our teeth, and move sweettarts with a straw. After that, we ate cake and roasted marshmallows. But we really just played chubby bunny with the marshmallows. The record was 12 marshmallows in one mouth. Crazy! We danced in my backyard with the help of the bates brothers DJ service. But really, they have awesome music. And we danced and jumped and had a blast. Let's be real. It was one of the best times.